Around 696, Duke Theodore of Bavaria gave the young bishop Rupert of Worms a grant of land in what is now Austria. A small Benedictine monastery called St. Peter's already existed in the midst of what was left of a Roman town. Rupert made the monastery into a launching pad to evangelize the eastern Alps. He also founded the convent of Nonnberg, the oldest continuously existing female convent in German-speaking lands. In about 100 years, Salzburg went from being a ruin of a Roman town to being the center of missionary activity and learning in its region, with a monk-bishop supervising many monasteries and churches. What happened in Salzburg also happened elsewhere. Just as they built new buildings from old Roman materials, these medieval missionaries adapted or replaced elements of the pagan culture they found, constructing a new Christian culture in its place. Again and again, monks built a monastery in an isolated spot, observed pastoral and educational needs in the local population, and responded by establishing schools and taking on pastoral tasks. Monasticism was a lay movement of people seeking an uncompromised Christian life, but by the 12th century half the Benedictine monks were also ordained priests. Benedict's Rule had never envisioned monks engaging in pastoral or missionary activity. But even in Benedict's own life, the contemplative and the pastoral roles went hand in hand. In the year 600, Christianity was almost entirely an urban religion, centered on the still surviving, if often decaying, cities of the Roman Empire. By the time Charlemagne died in 814, Christians had moved into vast rural areas of the old empire, and a broad swathe of central and northern Europe—from Hungary through Poland to Scandinavia—had received Christianity for the first time. It was one of the most expansive and remarkable periods in Christian history, and it was largely due to the work of monks. Since the earliest period of the church, Christians had almost universally assumed that Christianity would develop within the boundaries of the Roman Empire and follow the contours of Roman life. Only in a few places did Christians attempt to evangelize the hinterlands beyond the Roman cities. Thus the word for “country-dweller” (paganus) also meant “pagan,” or non-Christian. After the Visigoths sacked Rome in 410, Christians felt a new urgency to evangelize the barbarians now living among them. Pope Celestine I sent Ireland its first bishop, Palladius, in 431, but Pope Gregory the Great (590-604) was the first pope clearly to imagine evangelization beyond the borders of the Roman Empire. He articulated the general principle that missionaries should adapt to existing societies as much as possible. Gregory is best known for sending a group of Roman monks to England in 597. Their leader, Augustine, established a community at Canterbury, earning him the name Augustine of Canterbury (to distinguish him from the early church father, Augustine of Hippo). Benedict wrote his Rule about a half-century earlier, but we don't know whether Augustine and his monks were Benedictine. During the seventh and much of the eighth centuries, monasteries based their practices on a number of different monastic rules then circulating. Only gradually did Benedict's Rule win out over the others. But already in the mission to England there were visible patterns that would occur repeatedly in succeeding generations, among Benedictines and non-Benedictines alike. 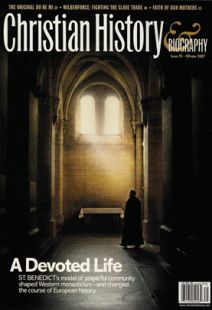 The Canterbury community lived a life of shared prayer and worship, without private property, in conscious imitation of the Jerusalem Christians described in the book of Acts. But the monks also preached the gospel outside the community, converting and baptizing many who, according to the early English historian Bede, admired “the simplicity of their holy lives and the comfort of their heavenly message.” Eventually they converted King Ethelbert of Kent, whose wife Bertha was a Christian from France. It was not uncommon in the years that followed for a Christian queen to be the agent of her husband's conversion. England was in many ways a half-tribal society. In a tribal society, the lower social classes tended to follow the king or chief. Thus, here and all over Europe, conversion tended to be from the top down. Bede tells us that Ethelbert let his followers decide for themselves whether they would become Christian, “for he had learned from his instructors and guides to salvation that the service of Christ must be accepted freely and not under compulsion. Nevertheless, he showed greater favor to believers, because they were fellow-citizens of the kingdom of heaven.” This top-down evangelism had a very practical benefit: Once the king converted, it gave the missionaries the protection and freedom to preach and build churches throughout the kingdom. Many tensions emerged as Christianity moved into the countryside. Bede himself was not a missionary, but he lived in a Benedictine monastery in the north of England, at the edge of Christendom. One day, while the monks of his monastery were rafting supplies upriver, they were caught in the current and washed out to sea. The local peasants jeered as the monks struggled against the current. We can only guess what an unlettered peasant with a vocabulary of a few thousand words might have made of monasticism, ordered as it was around Latin chant and reading. For many, the monastery must have been a closed world. Still, many laypeople, especially country-dwellers, learned their Christianity by watching the monks, who presented a wide range of practices for lay imitation. They taught that labor was not a curse but something dignified, and that all of life should be ordered in a way that glorified God. They practiced regular confession and encouraged the people to do so as well. Laypeople attended the monks' churches and learned to pray. In succeeding centuries, those who could afford them sometimes used simplified versions of the monks' prayer books for their own private devotions at home. Christian worship and artwork of the time focused on Christ as the Lord of the World—an easy concept for people from a warrior culture to grasp. Boniface had been born Winfrid sometime in the 670s and educated as a Benedictine in England. He was subsequently put in charge of a monastic school and ordained a priest. But his greatest desire was to preach to the Saxons in Germany—one of the tribes that had invaded and settled England in the 400s. He later wrote an open letter to English Christians reminding them that the Saxons were their kin: “Have mercy upon them because their repeated cry is, 'We are of one and the same blood and bone! '” He received permission to undertake a mission to Friesland (now part of the Netherlands) in 716. Two years later he was in Rome, receiving papal approval to preach to the right of the Rhine. Boniface found much to lament when he arrived, especially in Thuringia in central Germany, an area that already had pockets of Christianity. But as was the case elsewhere in Europe, political turmoil and corrupt leadership had bred laxity, and many Christians had half-lapsed back into their native religion, mingling Christian and pagan practices in ways that tested the limits of orthodoxy—and the missionary's patience. Boniface had only limited success here, but back in Friesland he fared better, converting many and establishing monasteries. This was the pattern of his life: sometimes succeeding, sometimes not, but all in all spreading Christianity and Benedictine monasticism far and wide. Like many of his fellow missionaries, Boniface engaged in a kind of theater to win converts—something like the prophet Elijah taking on the priests of Baal—and he must have been viewed as a miracle-worker. In various places he cut down oaks that the pagans had held sacred, and at Geismar built a chapel out of the wood of one such tree. When the god Thor did not strike him down, many people converted. Boniface tried to present Christianity in a form comprehensible to these cultures, while drawing a line at things that were simply not acceptable. Christmas trees were in; sacred oaks, out. Boniface's journeys ended in 755 when he ventured beyond the reach of royal protection. One morning, a band of armed looters attacked him and his fellow monks as they gathered to baptize converts. Tradition has it that Boniface tried in vain to block their blows with a Book of the Gospels. Anskar was anything but lazy. He founded the first church in Sweden and the first school in Denmark. He held many offices—from abbot to archbishop to papal legate. He began charitable activities, such as building hospitals, and worked to mitigate the effects of the Viking slave trade. But he also suffered many reverses: Pagans burned down his school in Denmark and ran him out of the country, and after his death a resurgent paganism destroyed most of his work. Anskar repeatedly saw his efforts undone, but he did live to see the conversion of the King of Denmark. The dangers and challenges Boniface and Anskar faced witness to the fact that much of Europe remained unconverted during this period. But the stories of their lives, written down and embellished by followers and successors, served as models and inspiration for countless other monastic missionaries. Always trying to find common ground with those they were evangelizing, these missionaries built monasteries, churches, and schools all over Europe. Along with failure came great success, and the period of the conversion of Europe was followed by the astonishing flourishing of Christian culture in the high Middle Ages. Glenn W. Olsen is professor of history at the University of Utah. Bede gave us the single greatest source of information we have about Anglo-Saxon England. Under Charlemagne's influence, the monasteries shaped the future of Western education, trade, and even handwriting. Not everyone who influenced the development of monasticism was actually a monk. Case in point: Alcuin. As the peace and unity of Europe collapsed, the monastery of Cluny pointed a new way forward.